HELLTOWN BEER: Kei Kamara, or Trade? So, this yellow shirted gentleman is Kei Kamara. He is 30 years old. He was born and raised in Sierra Leone. He moved to the states when he was 16. Mr. Kamara is a forward. He has played a number of years in Major League Soccer. He has played for Columbus (appearing in 36 games), San Jose (12 games), Houston (32 games) and Kansas City. 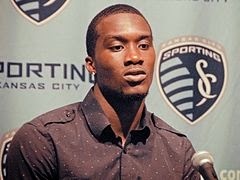 Kansas City is the club for which Kamara played the longest period of time, 5 years. 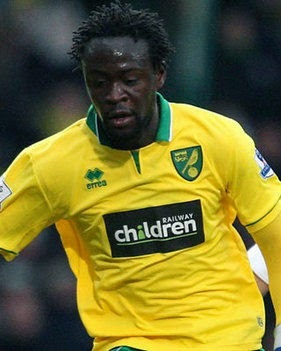 Recently, Kei Kamara has been knocking the ball around England, first with Norwich City for 11 games, and then with Middlesbrough for 25 games. He and Middlesbrough have parted ways. With the exception of Kansas City, it seems Kei Kamara has had a difficult time staying in one place for long. The Columbus Crew hold the first spot in Major League Soccer's allocation order. If the Crew want Kamara, and Kamara wants to play in Columbus, he is the Black and Gold's to have. But does Kei Kamara fit into what Gregg Berhalter has been building the last nine months? Would Gregg Berhalter and the Columbus Crew be better off trading the first allocation spot to another Major League Soccer team for a different sort of forward? Rumor has it that Kamara wants to be in Kansas City or Vancouver. Rumors are often flights of fancy born on the wings of angels made out of milk chocolate and caramel. But...let's suppose the rumors are a tad bit more than sweet dreams floating heavenward. Vancouver and Sporting KC have some interesting forwards on their rosters. Forwards that, on the surface at least, would seem to make a much more comfortable fit with the Crew's existing roster and style of play. These young men are, in order from top to bottom: Soony Saad, 22-year-old currently playing for Kansas City; CJ Sapong, 25-year-old currently playing for Kansas City; and Darren Mattocks, 24-year-old currently playing for Vancouver. All three of these footballers are dynamic young strikers. In Saad's case you have a player who left college, University of Michigan, at the age of 19, having scored a freshman record nineteen goals. Soony also lit up his high school senior season with 76 goals. CJ Sapong played four years at James Madison University. His 20 goals in 103 appearances for Kansas City hint at his fearless attitude inside the opposing teams penalty area. 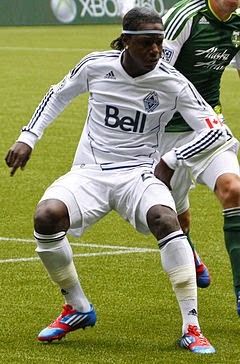 Darren Mattocks played at Akron University for two years. He helped lead the Zips to a national title his freshmen year. Mattocks scored 39 goals in just 47 appearances for Akron. Each of these players brings something unique to the field. Saad is a clever striker, who frustrates defenders with quick off-the-ball movement. Sapong is a handful for any Major League Soccer defender. He is strong and disruptive. Mattocks is, perhaps, the finest athlete in MLS. All three possess above average skill on the ball and the ability to read the game well. All three would be a better fit with Greg Berhalter's Columbus Crew than would Kei Kamara. They are young and would find many contemporaries within the Crew's roster. They each bring something to the forward position which the Crew do not currently get from their stable of strikers. With the exception of CJ Sapong, they have another year or two to develop who they are as players. If the Black and Gold can work out a deal for one of these young players, and not lose too much of their allocation money in the process, Gregg Berhalter and his staff will still have enough wiggle room going into next season to sign two players of Frederico Higuain's stature. Allocation money, cap room and an owner willing to add another moderately priced Designated Player in January or February would make the Columbus Crew a force in Major League Soccer. Snatching-up one of the three young forwards above would be a coup for Gregg Berhalter as the 2014 season rushes to a close. If a trade is possible, Mr. Berhalter should make it...NOW! If the trade deadline has passed, then the Crew should make the same deal the day the season ends or as soon as the impenetrable rules of MLS allow. *Update: The trade deadline is September 15th. Edit: In case I wasn't clear, along with the first allocation spot the Crew would have to include some of their allocation money in order to get any of the three young players above.